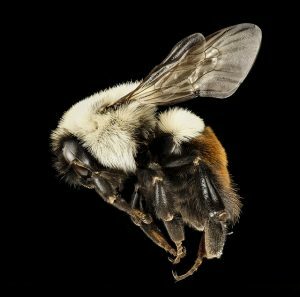 The common Eastern bumblebee is one of 46 native bumblebee species in the U.S. Photo by Sam Droege, USGS. Flowering plants and pollinators depend on each other. It’s a global truism, and it’s true on a 440 acre blueberry farm in northern Florida. Wild bumblebees – and there are 46 native bumblebee species – pollinate for free. But farmers often rent honeybees. Honeybees are trucked in when blueberry bushes bloom, and trucked out when the blooms fade. They crisscross the country on 18-wheelers, travelling from one crop to another. 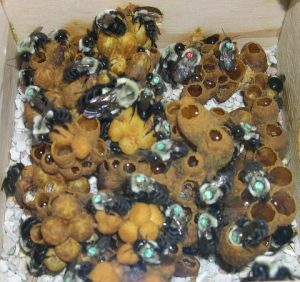 In some years, beekeepers have lost about 40 percent of their honeybee colonies. A combination of pathogens, disease, habitat loss, and pesticide exposure could be hurting honeybees – and wild native bees could be affected too. O’Brien and his colleagues designed the study to see whether managed bumblebee colonies could help pollinate blueberry crops. Joshua Campbell, a post-doctoral researcher at the University of Florida, led the study, which was published in the journal Environmental Ecology. Florida farmers usually grow highbush blueberry, or Vaccinium corymbosum. Highbush blueberry starts producing fruit as early as April. The bushes produce more fruit when cultivars cross with each other, so the farm had two cultivars – Emerald and Millennia. Most native bees are solitary, but bumblebees live in colonies. Photo by Jenny Jandt, courtesy of Wikimedia Commons. O’Brien and his colleagues built cages around groups of blueberry bushes. The cages kept bees in – or out, depending on the treatment. All pollinators were kept out of the control cages. Bumblebee colonies were added to other cages, and some plants were left uncaged. The uncaged plants were available to both managed bees and wild bees. Pollinated blueberry bushes produced as much as 70 percent more fruit than the un-pollinated controls. The increase did not depend on the size of the bumblebee colony. Uncaged plants that were pollinated by wild bees and managed bees also produced more fruit. Some of the uncaged bushes were mostly visited by honeybees, perhaps because the farm was so large. “The bumblebees may have dispersed into other fields,” says O’Brien. The significance of wild native pollinators is hard to measure. Other studies have shown that on smaller farms, native bees are very effective pollinators of blueberries and other crops. For more information, email Joseph O’Brien at jjobrien@fs.fed.us.